The second half of the Stallion AI Services stallion parade focused on dressage horses, and there was a real selection of bloodlines to choose from. Opening proceedings was one of Woodlander Stud’s 3 year olds by the world’s leading dressage sire De Niro. Dvorak didnt catch my eye in the stables as much as some of the others but under saddle he was very relaxed for such an inexperienced horse, and is a well proportioned, medium framed horse. His sire De Niro needs no introduction as a leading sire of both stallions and sport horses (Desperados, Dablino, Dante Weltino). The dam competed up to Intermediare level and is a daughter of another legendary sire in Florestan, ancestor of some of the most popular young stallions in breeding (Furst Heinrich, Fidertanz, Furstenball). This BWBS graded stallion is normally ridden by Jess Palmer but as she was unavailable her trainer Paul Friday stepped in. He had a lovely attitude in the stable. The canter had a nice rhythm and he had a very good supple walk. 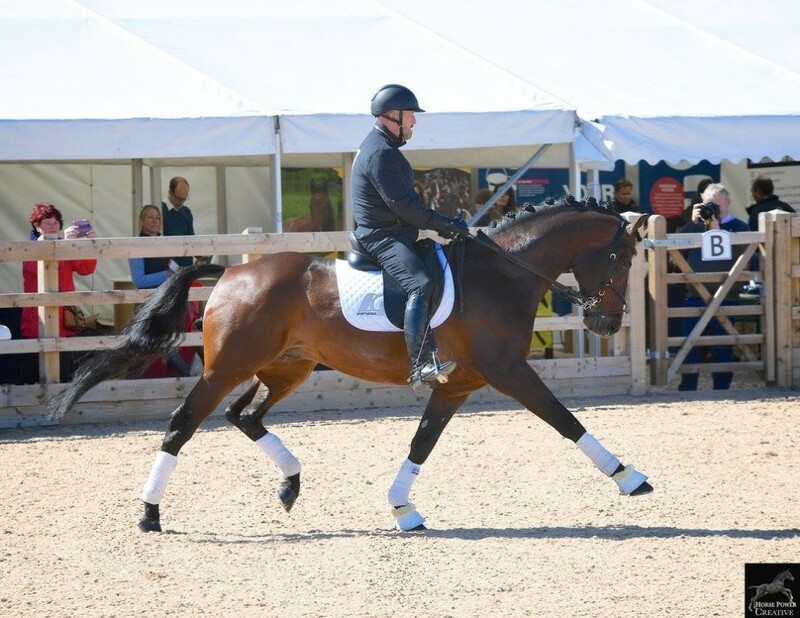 He showed his more advanced level of training with tempi changes and lateral work. 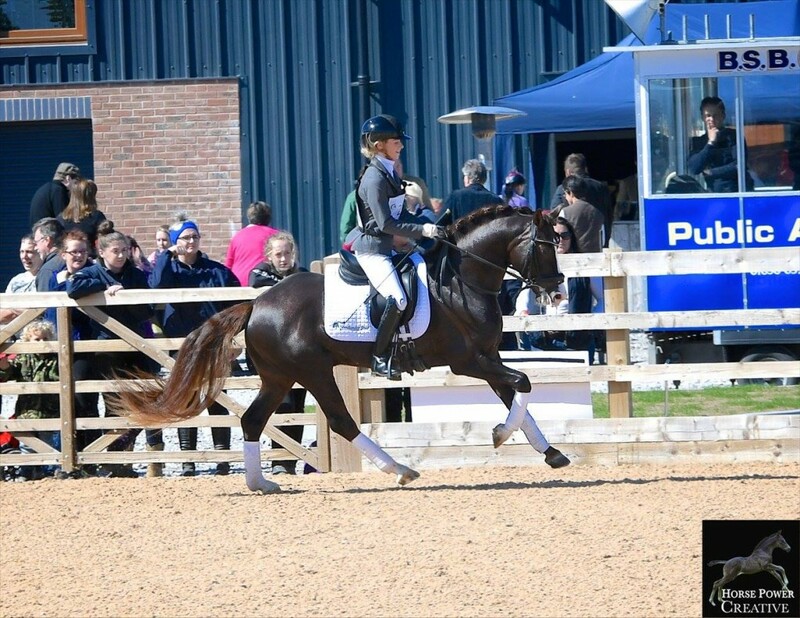 He was 6th in the Advanced Medium at the recent Winter Championships, and will contest his first PSG soon. A rare black graded Spanish stallion, Habanero was shown in hand. He is short coupled with a better walk than I was expecting. He also showed a good reach in the foreleg in trot. Habanero competed up to Intermediare I at CDI*** level. Although very green under saddle, this young British bred stallion demonstrated a good hind leg that came under the body well. 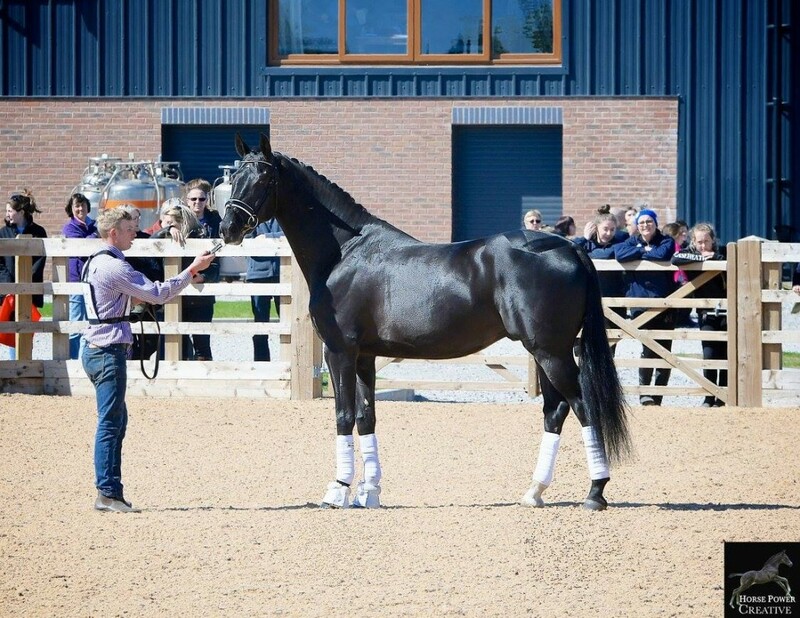 His sire was champion of the KWPN performance test in 2012, and is a son of the Grand Prix competitor Painted Black and also carries the blood of the other great Dutch stallon Ferro, Jazz and Flemmingh. The dam was graded with Elite status with the AES and is a daughter of the same owner’s stallion Amoureux who is competing at Advanced. This chestnut dressage pony caught my eye at Bury Farm in January and looked even better again today. Light footed and active, with an uphill canter, the whole picture was very pleasing, especially as he is only 4. He was licensed with a Premium by the Weser Ems studbook and also by the SPSS. His sire, grandsire and damsire were all Bundeschampions and his dam a State Premium mare. 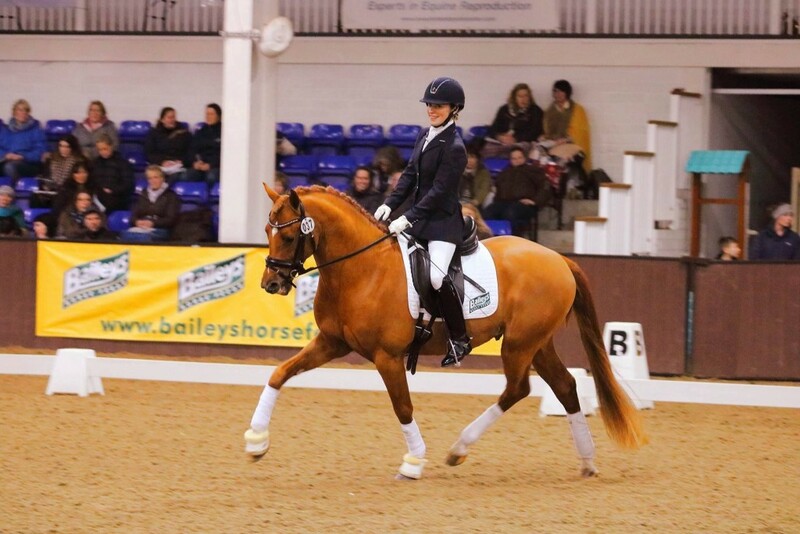 There is very interesting British Riding Pony blood further back in the pedigree including Catherston Nightsafe (sire of European pony team stalwart Catherston Nutsafe) and Whalton Copper Beech. Summertime Blues was shown in hand as he had a bruised heel. He is a product of a proven Woodlander mother line. His grand dam Alabama and her half sister were purchased by the stud as daughters of the German National Champion mare Pikantje. They have produced a great legacy of horses, including the licensed stallions Woodlander Bombay Sapphire and Santana. Summertime Blues was runner up at his performance test in Germany, with good scores for his walk, canter and ridability. His sire is the Celle based Hanoverian stallion Sporcken, a son of Sir Donnerhall, who also possess an excellent walk and brings in the valuable Thoroughbred blood of Lauries Crusador. Another stallion shown in hand, he is a very tall horse, with a big front. The walk was a little tense but the handler showed him very well. 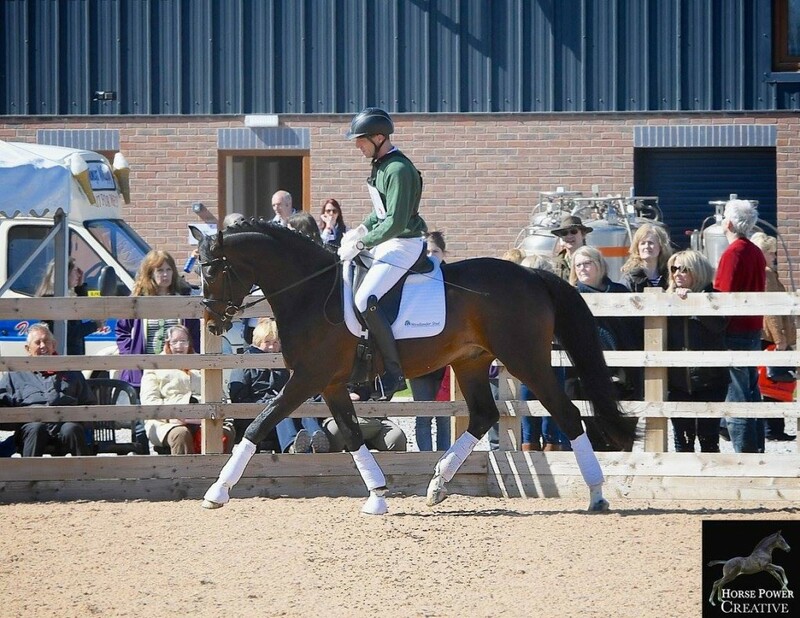 He is a son of the very popular Dutch stallion Dreamboy who did very well in young horse classes and is now competing at small tour with Hans Peter Minderhoud. The damline has a number of ster and keur mares. The dam sire Havidoff has been influential as a damsire including the KWPN Reserve Champion Dude and performance test winner Desperado. This SPSS, WBS-UK & Weser-Ems graded sport pony stallion shows his Welsh heritage clearly in his very active trot. His lovely young rider showcased him very well, particularly his excellent big striding canter. Wales was Champion of his grading but is only just starting his career in sport. His sire Wawavoom competed to advanced level and is the sire of a number of licensed stallion sons and top Futurity offspring. The dam is a Welsh Section C mare. This German bred stallion was shown on the lunge due to his owner/rider’s pregnancy. He was very calm and relaxed, with a pleasing trot. He could show more hock flexion in the canter. His sire is an interesting one for dressage breeder’s as he brings the jumping blood of Contendro, who is the current world number 1 eventing sire, with that of top broodmare sire Pik Bube (De Niro etc). His dam sire and great dam sire, are leading names in dressage breeding. This attractive stallion showed a bit of tension today, being a little reluctant at times. He has a very cadenced trot showing the beginnings of passage. Ruth Edge will be training him this season. His sire Johnson competed for the Dutch team at the Rio Olympics and is a classic cross of two top Dutch sires in Jazz and Flemmingh. The dam line contains a lot of jumping blood through Lanciano and Grannus and has produced a number of 1.40 and 1.50m horses. This young stallion impressed with how much he has strengthened and improved since January. He is a lot stronger across the topline and carried himself in nice balance and self carriage. He also looked very ridable. His sire Dante Weltino is a grandson of the great De Niro and is himself established at Grand Prix and was selected for the Swedish team for Rio at just 9 years of age. The dam sire Medoc was a consistent all round sire for many years in the UK including advanced eventers, show ring champions and advanced dressage horses. Further back the damline brings in Thoroughbred blood. This Grand Prix stallion was Spanish National Champion and shortlisted for the 2012 Olympics, but suffered a serious colic attack which left him with a fallen crest. Now used as a schoolmaster due to his excellent temperament, he showed good tempi changes and the typical high knee action of the breed. As a double European Gold Medallist, this pony had the most impressive competition record of the ponies forward. The canter was very light footed and balanced but the trot looked a little flat compared to his normal expression. 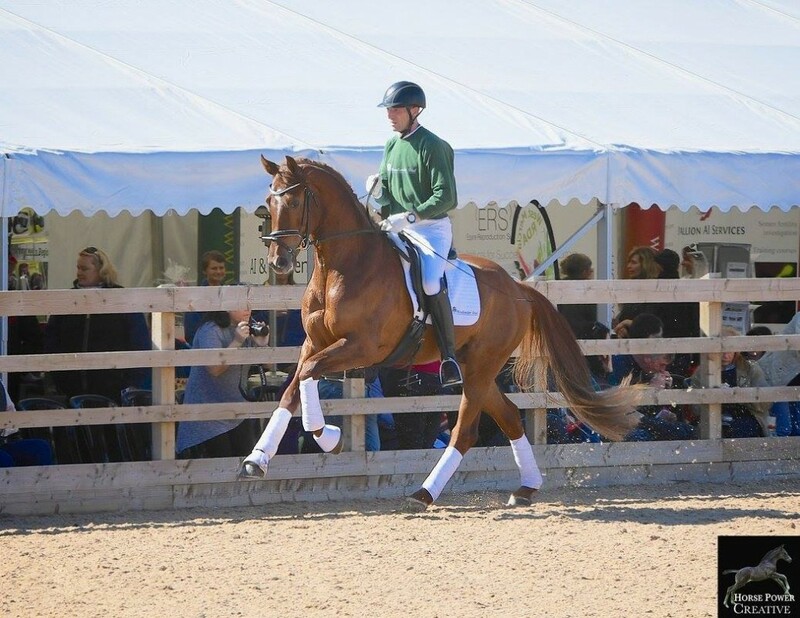 His sire Renior has sired a number of good offspring in the Weser Ems studbook, including a full sister to Rembrandt who is on the German Pony Eventing team.The damsire hails from British lines and was twice Reserve Bundeschampion with a lot of offspring successful in sport. The grand damsire also hails from the British Coed Coch sire line and has produced successful offspring at a high level in all disciplines including driving. Ridden by new owner Vivienne Chang, who will be aiming him at the Asian Games. He makes a very attractive picture, balanced and in a good frame. He is not the most flashy mover but very correct and harmonious. His late sire Furst Heinrich has produced quite a dynasty of popular stallion sons including Furst Romancier and Furstenball and is also the sire of dual Young Horse World Champion Farouche. The dam sire Acord II was a consistent sire of top show jumpers and has produced some very good daughters. He was known for his high ridability. This horse caught my eye in January at the Bury Farm stallion show and did so again today. He was the best mover of the day with a really elastic trot ad huge canter. He shows a lot of ability to tuck the hind quarter which bodes well for collected work in the future. His sire Don Frederic wowed the German audiences when he was first shown under saddle at the Schockemohle stallion show with his fabulous cadence and expression. Now competing at PSG level he looks set to continue the legacy of his super sire Don Frederico (sire of Diva Royal and Don Johnson). The damsire Rousseau is best known as the sire of Grand Prix and top sire Blue Hors Zack. The damline has produced top stallions such as Laudabilis. After the dressage horses had completed, the jumpers once again took centre stage. No introduction was needed for the dual Olympic Gold Medallist who had the biggest crowd outside his stable and the biggest crowd to watch him parade under groom Mark Beaver. Now available both chilled and frozen to UK breeders, he is a big powerful horse. Slightly plain head compared to the likes of Arko, but he has a super pedigree to back up his performances in sport. Sire Quick Star was an international performer in his own right and besides Big Star has produced top horses such as La Stella, OBOS Quality and Castlefield Eclipse. Dam Sire Nimmerdor is one of the most famous sires in Dutch breeding. Big Star’s dam is the half sister of the KWPN stallion Matterhorn. Big Star was then joined by the two other Olympic show jumpers Arko III and Jaguar Mail for a presentation and finale. To have three top performances horses like this standing in the UK, is a great asset for British breeders. All three offer something different in terms of type, size and bloodlines and are a credit to the team at Stallions AI Limited that such international stars are entrusted to them. 2017 was my first visit to the stallion parade hosted in Whitchurch, Shropshire by the team at leading equine reproduction facility – Stallion AI Services. The stallion parade was also a chance to show the public the super new stallion barns, arena and collection facilities that the team have invested in. With the new facilities and great reputation, it is no surprise that some of the world’s best stallions are now based there. The parade was split into two sections, with the jumpers in first and the dressage horses after the lunch break. The stallions are listed here in the order they were presented. Langaller Stud is based within easy reach of the M5 in the lush Devon countryside. Although famous for their success in the show ring, Langaller stock are also highly regarded in the hunting field and on the eventing circuit. The stud is run by Charles Upham who is enthusiastic about all 9 of the stallions they are standing for 2017, and there are two I particularly feel will be of real interest to serious sport horse breeders.